As a city dweller, I daydream about hitting the open road in a sporty red convertible, cruising across wide-open swaths of majestic Southwestern terrain while the soundtrack of my life blares through the car speakers and the city limit fades in the distance. But then I remember that I’m the owner of a four-door sedan with a busted stereo, and my work schedule isn’t conducive to impetuous road-trip adventures. Fortunately for me, the city in which I dwell—Phoenix—provides plenty of shortcuts to roads less traveled, where the desert surroundings and mountaintop views make me feel like I’ve ventured a million miles outside my urban comfort zone. Below are three of my favorite scenic drives within the bounds of metro Phoenix. Each will give you a different perspective of the city and maybe teach you something new along the way. Renting a sporty red convertible is optional. The Apache Trail is legendary because it was once considered the most treacherous stretch of highway in the country. Today, the well-traveled road still requires some adept driving—the speed limit is 15 mph—but the narrow and tight turns deliver jaw-dropping portals to canyons, cliff dwellings, jutting rock formations, sparking blue lakes and dense desert flora. 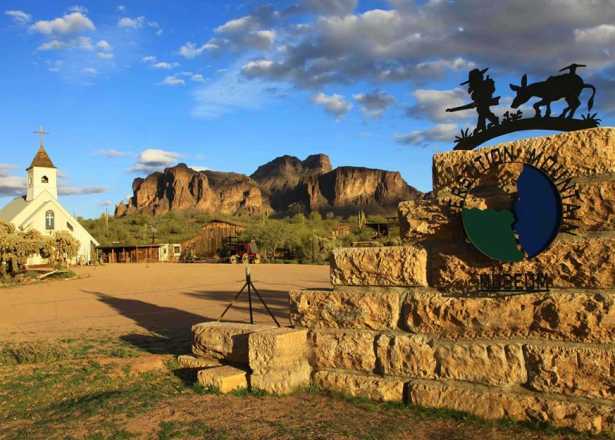 The 40-mile Apache Trail, which links Apache Junction to Globe and circles the Tonto National Forest, is best explored as a daytrip, but it’s a doable as a half-day outing. The trail starts at the intersection of Arizona State Route 88 and Idaho Road in Apache Junction, about 35 miles east of downtown Phoenix. 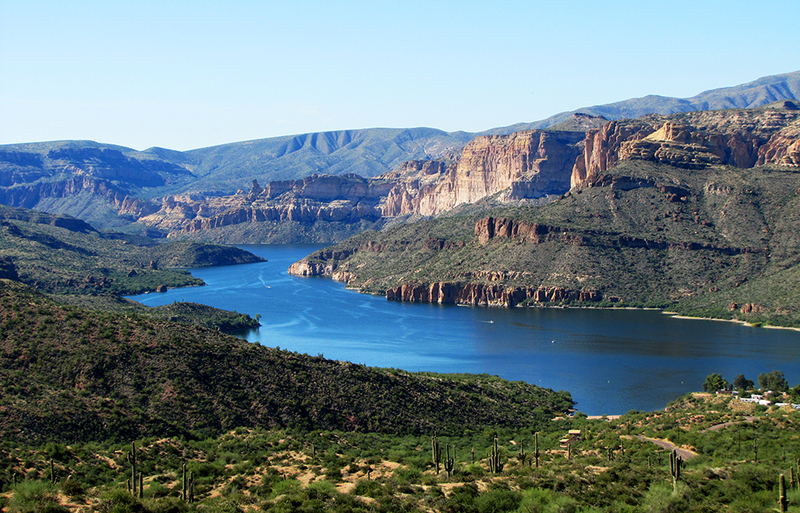 There are many scenic pullouts and stop-worthy attractions along the Apache Trail. Among the first you encounter is Goldfield Ghost Town, which offers a tour of a former gold mine. From there you travel through Lost Dutchman State Park and the Superstition Mountains, then past Saguaro Lake, Canyon Lake, Apache Lake and Theodore Roosevelt Dam (at one time the world’s largest masonry dam at almost 300 feet tall). You also can visit cliff dwellings before ending in Globe, a former copper-and-silver boom town where historical buildings remain from its mining heydays. A charming, midpoint lunch marker is Tortilla Flat, a former stagecoach stop that is now an incorporated town (population 6) with an Old West-themed restaurant and bar, a tiny post office, and a gift shop with quirky Arizona souvenirs and mining relics. If you don’t feel worlds away from the big city by this point on the Apache Trail, you will soon after: Because beyond Tortilla Flat the road is unpaved. But a four-wheel-drive vehicle isn’t required to complete the journey—you just need gas in the tank and a willingness to keep rolling on. Sometimes the end of the road is anticlimactic. It’s just a place where you have to turn around. But not every road is punctuated by a period; some end in exclamation marks. Such is the case with the road leading to Dobbins Lookout. 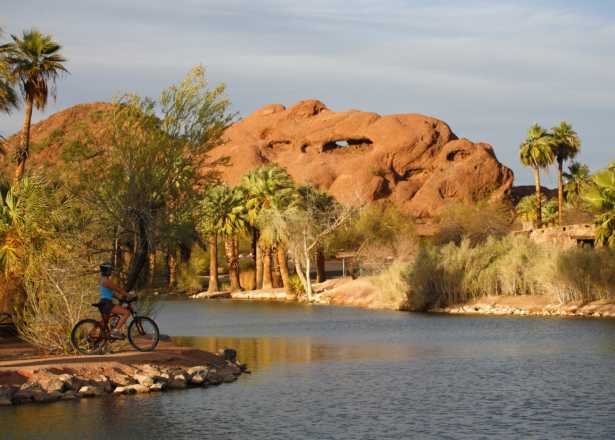 This is an easy scenic drive if you’re staying in downtown Phoenix. All you have to do is get your car to Central Avenue—the road that serves as the city’s east-west dividing line—and head south. Central Avenue ends at South Mountain Park, a 16,000-acre municipal recreational facility that is free to the public. After you pass through the park’s main entrance gate, Central Avenue becomes Summit Road, which leads to Dobbins Lookout. The 15-minute drive from the base of the mountain to the lookout is filled with curves and hidden bends (caution: cyclists and hikers ahead), but around every corner is a stunning view of the city. Once you reach the summit, you can park your car and enjoy what is arguably the best vantage point in the city. Dobbins Lookout sits at 2,330 feet and gives you the feeling you’re rubbing shoulders with the clouds. The view not only includes the Valley floor below, but a panoramic sweep that travels from the Estrella Mountains in the west to the Superstition Mountains in the east. For some shade or quiet reflection, stroll over to the stone resthouse, a Flintones-esque structure that was built by the Civilian Conservation Corps in the 1930s. This is one of the best places in Phoenix to watch a sunrise or sunset. Arizona State Route 51 (Piestewa Freeway) is a scenic drive unto itself, bisecting Phoenix Mountains Preserve and providing elevated views of the preserve’s rugged desert topography. But if you want a similarly picturesque view of the Valley and Piestewa Peak, exit SR 51 at Lincoln Avenue and then follow 24th Street south toward Wrigley Mansion. Sitting atop of a knoll overlooking the famed Arizona Biltmore resort, Wrigley Mansion was built in 1932 by chewing gum magnate William Wrigley Jr. The mansion—which fuses Spanish Colonial and Mediterranean styles—is perched high enough to give visitors a tree-skimming, panoramic snapshot of the city below. Wrigley Mansion is a private club, so it charges membership to dine and tour the property ($5 trial fee). It doesn’t cost anything, though, to take a short drive through the gates and up the driveway to the mansion’s front door for the spectacular view. If you’re so inclined, you can linger to enjoy happy hour, live music or Sunday brunch. Or you can just sit on the porch and watch the sun drop. 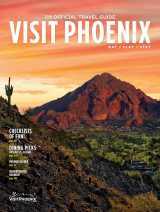 Sally J. Clasen is a Phoenix-based writer and committed sunset chaser. Her articles about travel, lifestyle and wellness have appeared in such publications and websites as Phoenix Home & Garden, Modern Luxury Scottsdale, The Arizona Republic, Arizona Spa Girls, AAA Highroads, AAA Home & Away, Bite magazine and Prime Living magazine. On the Apache Trail, white-knuckle curves, ghost towns, and scenic beauty abound. Discover incredible beauty in unexpected places on this urban scenic drive.